There are no preschool or progressive classes from Monday, December 24th through Tuesday, January 1st for the winter break! Classes will resume on Wednesday, January 2nd. Enjoy The Holidays! *If you need to get a hold of the office, we will be here limited hours in the morning on 12/26, 12/27, 12/28, & 12/29. We will do our best to get in contact with you at that time. Piper F. came home with a 1st place win on floor with a score of 9.2. She also placed 2nd on bars with a score of 9.4 and 3rd on beam with a score of 9.275! These scores helped her to her 1st place win in all-around, with a score of 36.525! Claire D. won 1st place on bars with a score of 9.475 and on beam with a score of 9.375! She placed 3rd on floor with a score of 8.925 and on vault with a score of 8.7. The placed 2nd in all-around with a score of 36.475! Kaleigh S. won 1st place on beam with a score of 9.375. She also scored a 9.2 on bars, leading her to place 3rd in all-around with a score of 36.075! Sydney H. won 1st place on floor with a score of 9.3! She also placed 3rd on bars with a score of 9.525! She earned an all-around score of 35.875! Rylann B. won 1st place on bars with a score of 9.575! She earned an all-around score of 35.35! Leah V. won 1st place on beam with a score of 9.4! She placed 4th in all-around with a score of 36.1! Ella A. tied for 4th on vault with a score of 8.8! She has an all-around score of 35.525! Meryl C. had her highest score of the day on bars with a 9.05! She earned an all-around score of 35.7! Chloe G. had her highest score of the day on beam with a 9.0! She earned an all-around score of 35.25! Sophia S. earned her highest score of the day on bars with a 9.125! She had an all-around score of 34.125! Rising Stars Silver team placed 3rd with a team score of 110.625! Brynna S. won 1st place on beam with a score of 9.3! She had her highest score of the day on bars with a 9.35! She tied for 4thplace in all-around with a score of 36.125! Courtney P. tied for 3rd place on floor with a score of 9.25! She earned an all-around score of 35.1! Viva S. tied for 4th place on bars with a score of 9.0! She placed 5th in all-around with a score of 35.2! Ellen S. placed 2nd on bars with a 9.475 and on vault with an 8.9! She earned an all-around score of 35.025! Samantha H. placed 4th on floor with a score of 9.125! She earned an all-around score of 34.5! Alex W. tied for 3rd place on vault with a score of 9.0! She earned an all-around score of 34.75! Alyse B. tied for 3rd place on beam with a score of 8.9. She earned her highest score of the day on bars with a 9.1! She placed 3rd in all-around with a score of 35.5! Katie H. tied for 3rd place on beam with a s core of 8.9! She earned her highest score of the day on bars with a 9.075! Kaia B. won 1st place on vault with a 9.15. She placed 2nd on floor with a 9.3 and 3rd on beam with a 9.0. She won 1st place in all-around with a score of 36.45! Makiah A. won 1st place on beam with a score of 9.2! She placed 2nd in all-around with a score of 35.95! Katie S. placed 2nd on bars with a score of 9.2 and on beam with a score of 9.15! She placed 3rd in all-around with a score of 35.85! Katie B. tied for 2nd on vault with a score of 9.0! She placed 3rd floor with a score of 9.125 and on bars with a score of 9.1. She placed 4th in all-around with a score of 35.625! Rising Stars Gold placed 2nd as a team with a score of 110.625! Bella G. placed 4th on floor with a score of 8.9! She earned an all-around score of 34.05. Jordan K. had her highest score of the day on vault with an 8.6! Kendall B. tied for 4th on vault with a score of 8.75! Sophie T. tied for 3rd on vault with a score of 9.1! Natalie D. placed 2nd on vault with a score of 9.15! Ava K. placed 3rd on floor with a score of 9.025 and on beam with a score of 8.8! She earned an all-around score of 34.775! Rising Stars Platinum team earned a team score of 104.95! Kayla K. earned her highest score of the day on vault with an 8.45! Lacey T. earned her highest score of the day on floor with an 8.8! Elise K. placed 3rd on floor with a score of9.325! She earned an all-around score of 34.45! Kaci U. took 2nd on vault and earned her highest score of the day on bars with an 8.875! She placed 4th in all-around with a score of 34.925! Ariah R. had her highest score of the meet on vault with an 8.150. She earned an all-around score of 30.225. Kayley H. earned her highest score of the day on bars with an 8.725! Laiken P. earned her highest score of the day on floor with a 9.1! She earned a 34.425 in all-around! August L. scored her highest on bars with an 8.3. She earned a 31.375 in all-around! Kaylee F. had her highest score of the day on vault with a 8.625! Julia Y. earned her highest score of the day on floor with a 9.025 placing 2nd! She took home 3rd place in all-around with a score of 34.825! Violet G. earned her highest score of the day on floor. She earned an all-around score of 32.525! Ava P. had her highest score of the day on floor. She earned an all-around score of 32.225! Abby W. earned her highest score of the meet on bars! She had an all-around score of 31.475! 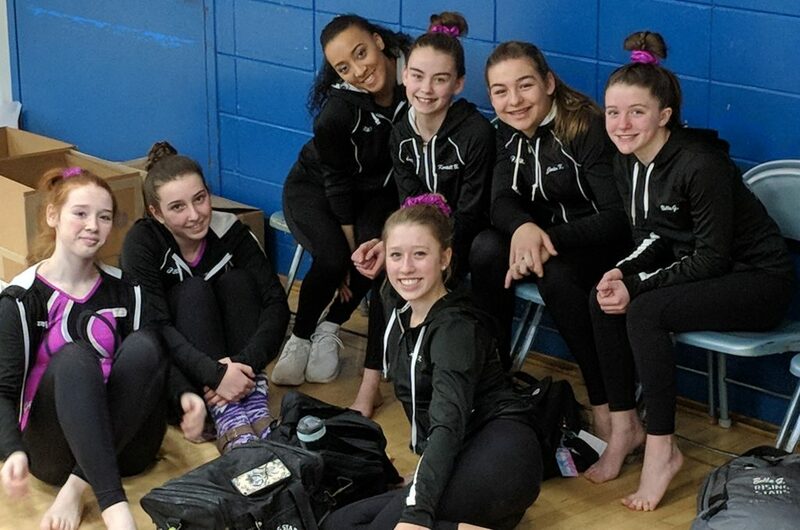 Congratulations to the Xcel Silver team that competed at the Glitz & Glam meet this past weekend. They won 1st place as a team with a score of 110.875! Congratulations to all of our gymnasts that have qualified for the State meet! In the 9 & under age group, Claire D. won 1st place on beam with a score of 9.45. She won 1st place in all-around with a score of 36.325. Veda C. won 1st place on bars with a score of 9.275. She placed 2nd in all-around with a score of 36.25! Piper F. won 1st place on vault with a score of 9.4 as well as floor with a score of 9.075. She placed 4th is all-around with a score of 35.975! In the 10-11 age group, Aliana B. won 1st place in all-around with a score of 36.425. Chloe G. placed 3rd in all-around with a score of 36.1! In the 12+ age group, Meryl C. placed 4th in all-around, with a score of 35.75! 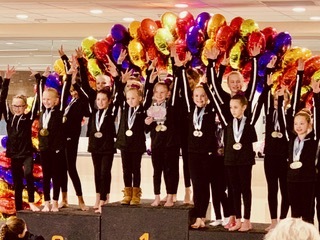 Congratulations to our Xcel Gold team that competed at the Glitz & Glam meet this past weekend. As a team, they took 1st place with a score of 109.35! Other congratulations to the girls that have qualified for the State meet! In the 10 & Under age group, Brynna S. won 1st place on beam with a score of 9.2 as well as vault with a score of 8.75. She took 1st place in all-around with a score of 35.1! Courtney P. won 1st place on bars with a score of 9.025. She placed 2nd in all-around with a score of 34.175! Mia D. won 1st place on floor with a score of 8.675. She placed 4th in all-around with a score of 33.8! In the 11-12 age group, Ellen S. won 1st place on bars with a score of 9.35 as well as vault with a score of 9.0. She took 1st place in all-around with a score of 35.7! Grace O. placed 2nd on bars with her highest score of the day at 9.175. She placed 2nd in all-around with a score of 35.375! Viva S. had her highest score of the day on vault with an 8.9. She placed 4th in all-around with a score of 35.025! In the 13+ age group, Katie S. won 1st place on beam with a score of 9.4 as well as vault with a score of 9.0. She won 1st place in all-around with a score of 36.25! Amanda H. placed 2nd on bars with her highest score of the day being 9.2. She placed 2nd in all-around with a score of 35.925! Ella K. won 1st place on bars with a 9.3 as well as floor with a score of 9.2. She earned 3rd place in all-around with a score of 35.75! Makiah A. took 4th place in all-around with a score of 35.0, Katie H. took 5th place in all-around with a score of 34.425, and Emma H. took 6th place in all-around with a score of 34.1! 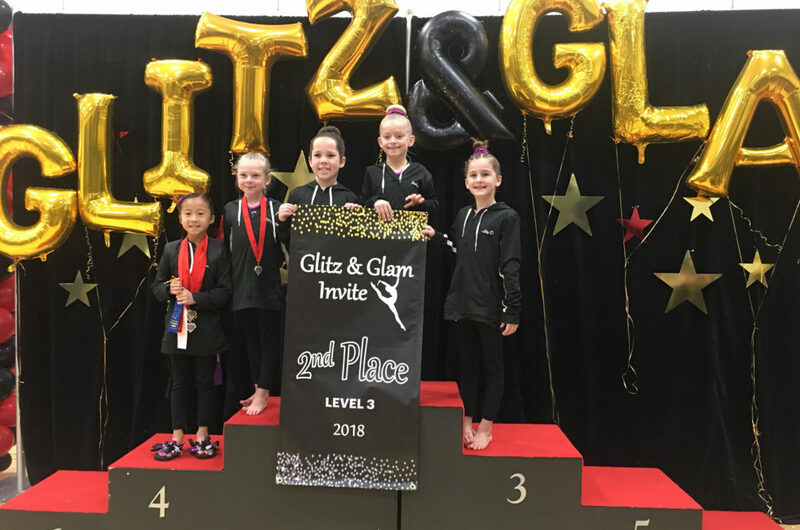 Congratulations to the Xcel Platinum gymnasts that competed at the Glitz & Glam meet this past weekend. They took 2nd place as a team, earning a score of 105.925! Congratulations to the girls that have qualified for the State meet! In the 12 & under age group, Jordan K. took 5th place in all-around with a score of 34.175! In the 13+ age group, Natalie D. won 1st place on beam with a score of 9.4 as well as vault with a score of 9.375. She won 1st place in all-around with a score of 35.275! Ava K. won 1st place on floor with a score of 9.0. She placed 2nd in all-around with a score of 35.2! Sophie T. placed 2nd on beam with her highest score of the day reaching 9.25! 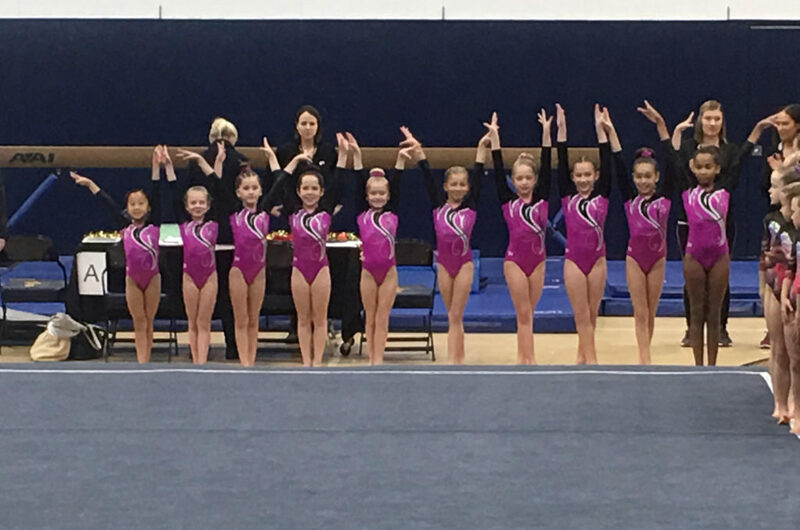 Congratulations to the Xcel Diamond team that competed at the Glitz & Glam meet this past weekend. They placed 1st as a team, with a score of 103.25! Congratulations to the girls that have qualified for the State meet! Elise K. won 1st place on all 4 events, with her highest score being a 9.375 on floor. She won 1st place in all-around with a score of 36.625! Kayla K. earned her highest score of the day on vault with an 8.75. She placed 4th in all-around with a score of 33.825! Anna B. earned her highest score of the day on vault with an 8.7. Lacey T. earned her highest score of the day on vault with an 8.65.